I find lawmakers fascinating. For example, when states fail to pass distracted driving laws in the name of “freedom,” aren’t they basically signing off on Darwinism (i.e. survival of the fittest)? It’s as if they’re saying “well you’re free to do it, but if you’re dumb enough to get hurt, that’s on you.” Of course that ignores the fact that innocent bystanders are affected. Would you believe that more than 1,000 people are injured and almost 10 people die every day in the U.S. due to distracted drivers? Of course you would, because virtually every individual who reads this has engaged in one distracted driving behavior or another at some point. Driving is difficult. Unfortunately, it’s not always simply our actions that lead to motor vehicle crashes. These crashes often involve more than one vehicle, and sometimes a drunk, distracted or otherwise impaired driver hits another car, the driver of which may be completely at attention. Thus, driving without distractions is about giving yourself the best opportunity to react to the conditions around you. I know it seems like virtually anything you do in a car, from having a conversation to sipping on a drink qualifies, and in the event that seems a bit overbearing, remember you don’t get to see the consequences of all the bad decisions that lead to various death and other calamities that show up in an emergency room. If nothing else, today, I’d like for you to especially consider eliminating texting while driving because it combines all three of the above forms of distraction. Here is some baseline data on motor vehicle collisions provided by the CDC. For the first time in nearly a decade, preliminary data from the National Safety Council estimates that as many as 40,000 people died in motor vehicle crashes in 2016. That marks a 6% increase over 2015 and a 14% increase over 2014 – the most dramatic two-year escalation in 53 years. An estimated 4.6 million roadway users were injured seriously enough to require medical attention, a 7% increase over 2015. This means 2016 may have been the deadliest year on the roads since 2007. Estimated cost to society was $432 billion. Here’s some data from 2014, the most recently updated information. 16% of all motor vehicle crashes in the United States involved a distracted driver. 431,000 people were injured in motor vehicle crashes involving a distracted driver. 3,179 people died in crashes involving a distracted driver. 520 non-occupants (e.g., pedestrians and cyclists) died in a crash that involved a distracted driver. At any given time in 2015, an estimated 2.2% of all drivers on the road were texting or visibly using a hand-held device – the same percentage as in 2014. 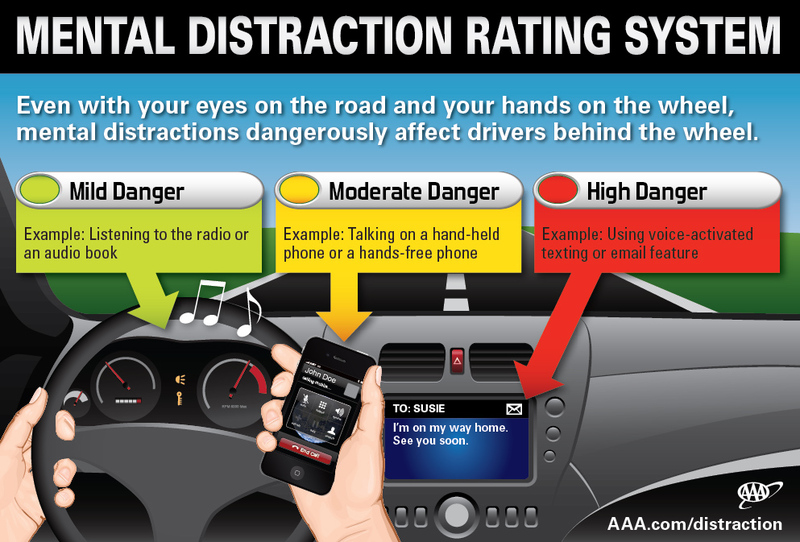 Research suggests that distraction is present during 52% of normal driving. Common distractions include interacting with an adult or teen passenger (15%), using a cell phone (6%), and using systems such as climate control and radio (4%). Many states are banning texting while driving, or using graduated driver licensing systems for teen drivers to help raise awareness about the dangers of distracted driving and to keep it from occurring. That said, at the end of the day, this isn’t going to be legislated away. Even you will or won’t reduce your individual risk, and that can be done in some very specific ways. While driving, place your phone out of reach, or just cut it off. While a passenger, be assertive in preventing the driver from engaging in distracted activities. It’s up to you. The life you save may be your own. I’ll text you later.